Product code: ES7529 Categories: Sold Items, Sold Rings. So elegant and beautiful comes this Art Deco sapphire and diamond engagement ring from the 1920’s that sits perfectly on the finger and is destined to be loved and cherished. Hand made in 18ct yellow and white gold, sitting in the centre is a lovely natural sapphire that measures 1.60 carats and is surrounded by fourteen diamonds to add an elegant amount of sparkle. Looking closely you will notice that not only are each of the diamonds set into a their very own box type setting, but the sapphire has the elegant millgrain finish which can be seen as the elegant crimping along the edge of the setting. This millgrain setting was popular during the Art Deco period and adds that extra level of charm and quality to the ring. With an additional diamond set on each side, the total diamond weight is 0.42 carats, and from one side diamond across to the other, this distance measures 15.1mm by 12.6mm. This is such a lovely and attractive Art Deco sapphire and diamond ring that will always be admired and complimented on. 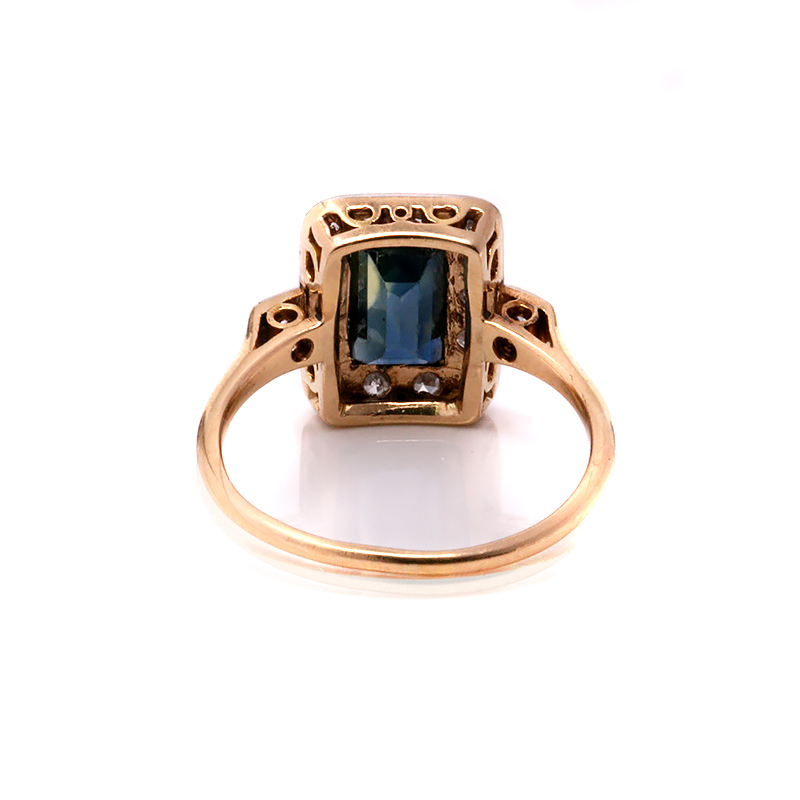 Tag: Art Deco sapphire and diamond engagement ring. Hand made Art Deco sapphire and diamond engagement ring from the 1920’s. This ring would make a wonderful engagement ring or for any other occasion or milestone. Art Deco rings of the 1920’s to the 1940’s often were designed in angular designs that really make a statement and accentuate the finger so well. Set with a sapphire surrounded by diamonds, this is a perfect ring to wear all the time.